This blog has been a long time coming! With university deadlines and going back home for Christmas, it's been a very busy time but finally I have time to write about my birthday back in November. For my 22nd Birthday I was surprised by my lovely mom and boyfriend for a night away to The Crazy Bear in Stadhampton. It had been on my wish list for such a long time to go even just for dinner but luckily I had an overnight stay. 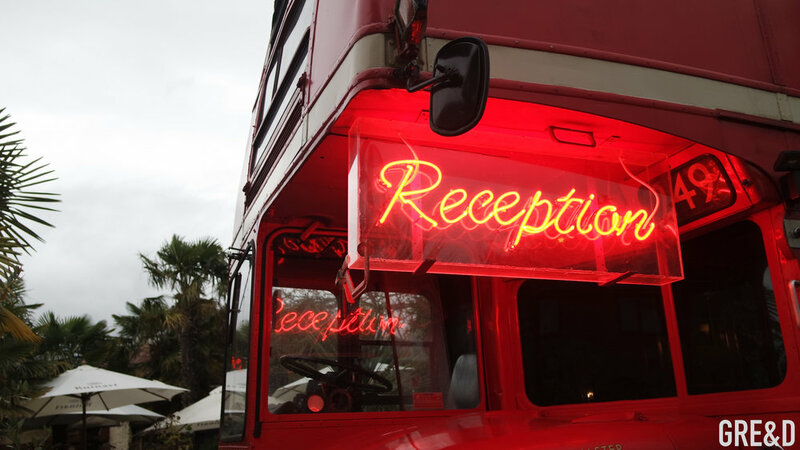 The reception is a huge red double decker bus which we were welcomed onto with a glass of champagne. Always a lovely start. In the Stadhampton chain the various suites are in small outhouses from the main hotel and restaurant. However we were in room 11 which was one of the main rooms in the hotel. To go up to the rooms you had to take a secret door which led us to a staircase. I can't even describe what it was like to walk into our room. It was like something I had never seen before. The whole room was dark purple crushed velvet. Floor and ceiling! In our room we had two gold guilted sofas which was so lovely adding a pop of colour to our room. 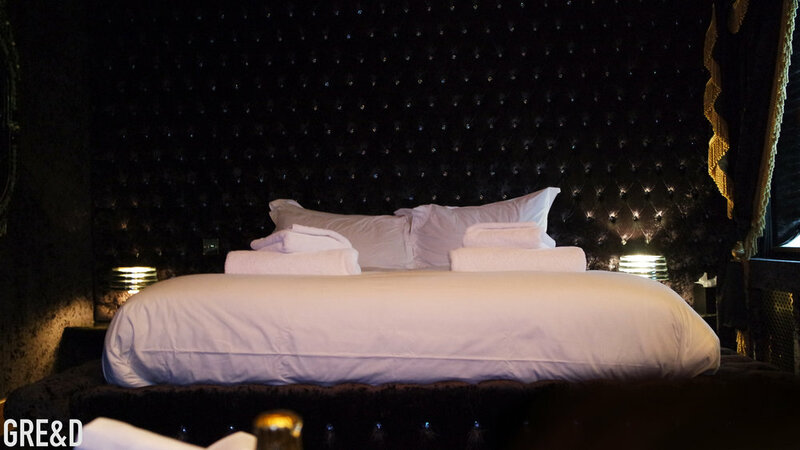 Taking photos of the room was a little bit difficult as it was so dark but you can see the bed and how HUGE it was! Welcoming us into the room was a large magnum of champagne which was all included in our stay. We had a lovely few hours to wonder around, as The Crazy Bear in Stadhampton has it's own farm where a lot of produce is harvested. There's a small farm shop where they sell their own jams, chutneys, eggs and breads! I wanted to eat some food in the farm shop but I didn't want to spoil the three course dinner we had coming! The Crazy Bear offer two restaurants to choose from; English and Thai. We opted for Thai as we both love Asian food so we thought being at the Crazy Bear would be extra special. The Thai restaurant was underground and again the walls were covered in this gold velvet with mirrored ceilings. It was actually a very small dining area, probably seated around 20 but because of the glass tables and mirrors it made the room feel a lot bigger. We were offered a three course set menu as it came with the overnight stay deal and the options were incredible. There were at least 4 options per course and any extras we wanted we could order at an additional price. The menu was so large and all of the other options were amazing. To start we shared some prawn crackers with sweet chilli sauce. Then a part of our course Andrea chose Salt & Pepper Calamari and I and Duck Spring Rolls, which were literally the hugest spring rolls I have ever had. They were so succulent and full of flavour. In the end we both shared our starters because we liked them both! For mains we both chose curries, which weren't heavy like a lot of curries I have had before. As a side dish we ordered coconut rice which again we both shared as one was so large that we didn't need two! Andrea had the Eggplant Panang, with baby courgettes, cherry tomatoes and grapes which was lovely because it was a sweet curry. I ordered a Sweet and Sour Chicken Curry with cashews. It had a lovely kick which I like in a curry as I thin kit really enhances the flavours in the dish. For dessert I ordered the fruit plater which so so yummy, as it was all tropical fruits and was a nice end to the meal as after the curry it was a refresh and didn't make me feel heavy and bloated. Andrea had a chocolate creme brûlée which he loves. After dinner we had a few drinks at the bar and then called it a night and went to bed after all we travelled from London to Stadhampton on a coach and then a bus through the countryside! In the morning we had complimentary continental breakfast which was also very lovely, lots of fruit, yoghurts, cheeses and meats. All my favourite things at once. The interior of The Crazy Bear was like a mixture of Alice in Wonderland with like high glam. I feel like I can't really explain what it is like unless you have been or are going and then you will get what I mean! It's a real experience and for an overnight stay you feel like you're in absolute luxury. It's also so great to have a little escape to the countryside. Thank you again to my wonderful mom and boyfriend for a great time. And to The Crazy Bear for being great hosts.